A global recession will always be there. But, the existence of the British beauty industry will remain recession-proof. With the help of the latest innovations such as projected capacitive touchscreen (PCAP) technology, no wonder, the industry will survive and thrive. Geared to improve productivity and efficiency with a 2.0 GHz Quadcore processor powered by Intel BayTrail-M/D, PCAPs are also designed to perform specific functions with IP68-rating capabilities. Thus, it perfectly fits the extreme operating conditions in the beauty industry. Not only women boost the beauty industry in the UK but also men’s beauty covers a broader field. As a matter of fact, this includes toiletries, skincare, haircare, cosmetics, and fragrances. So, when you talk about beauty, it is also all about the overall package. But, you can only offer high-quality products if it also undergoes rigid operations and standard procedures. Lucky are those who have 17” embedded computing system in their working environment. They don’t have to manually estimate the correct formula of a certain product since an embedded computing system is designed to gather data, transmit data from testing to manufacturing, and controls the quality as well. Such kind of computing system is also touchscreen technology-enabled, which makes it easier to use. So, how can you utilise PCAPs in various fields of beauty industry? Check this out. There is a big business in the UK beauty industry. But, along with it, there is also a tough competition to beat. If you have that will-power to beat them, optimising your field is the best bet. So, whichever of these fields you currently belong, installing PCAP monitors for manufacturing and production of your preferred business is the best option. To provide high quality and hygienic toiletries must have an organised business operation. From manufacturing, a mixing room is not enough. This must have a regular monitoring, tracking, and controlling to ensure that the best quality of water is used for mixing the product and it can be all performed through advanced 17” PCAP devices. Then from production, your operating system must work efficiently in terms of filing, labelling, and packing capabilities. But, with the power of touch technology, the said tasks can be completed without a system failure. Take note, PCAPs are low power consuming equipment with no moving parts. Hence, it requires lesser maintenance. The manufacturing process of cosmetics is the easiest to understand if it is only viewed as 3 separate steps, which is melting and mixing, moulding, and packaging. But, beyond that process is also the most complicated procedure. To perfectly master cosmetic manufacturing, your operations must be equipped with 17” PCAP panels. Aside from the fact that it can organise and control an operation, it can also withstand the harsh environment. 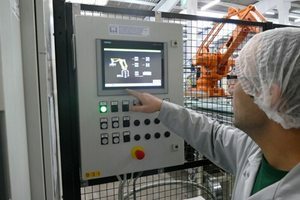 The fact that the manufacturing process has a wide temperature range, only industrial-grade computers (IC) can endure such extreme working conditions. The beauty business in the UK is in pink but the road to success is even harder to beat without the right investment. Incorporating a PCAP technology in your business would be an A-plus and quantifying your benefits in the future would be limitless. So, now is the time to take impact in the beauty industry. Talk to an IC expert and get your own projected capacitive touchscreen panels.